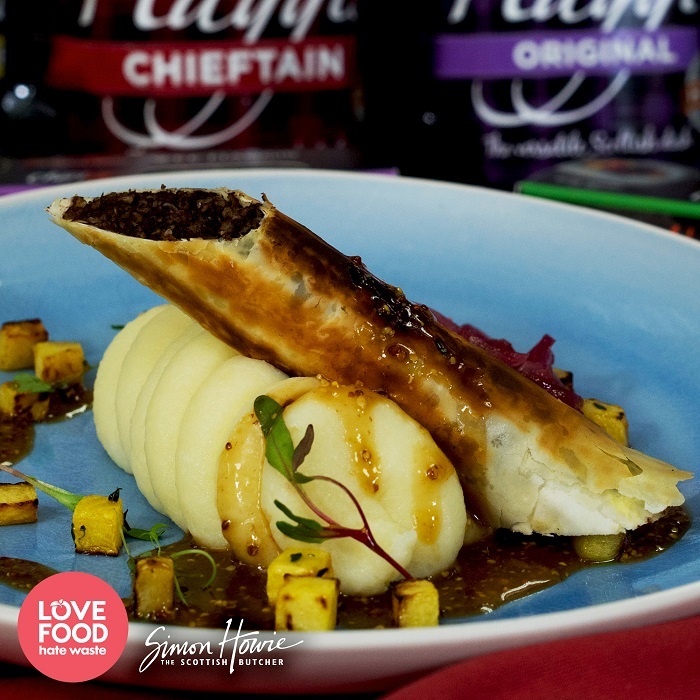 A deliciously different way to enjoy haggis, these crispy rolls make an excellent starter, or a quirky alternative to the traditional Burns Night supper. Break down the haggis, then roll into tubes approximately 15cm long and 10mm thick. Half the sheets of filo pastry and wash with beaten egg, then lay the haggis on the pastry and roll up tightly. When you are ready to serve, shallow fry your pastry-wrapped haggis until crisp, turning frequently. Peel and cut the turnip into small dice. Place into a pan with the butter and herbs and slowly cook. Baste the turnip with the butter. Cook until turnip starts to caramelise. Boil the potatoes in salted water until cooked. Drain and leave to dry out in the pan. Beat in the butter and add the nutmeg and seasoning to taste. Pipe or spoon the mash on to the plate. Slice the haggis and place on top. Serve with the mashed turnip and red onion chutney, and gravy if desired. Chef, cookery tutor and owner of Pop food business in Edinburgh, Steve Brown, shares his Halloween themed risotto recipe. Milk is a great secret ingredient in loads of recipes – so there’s no need to chuck it away. If you have a couple of apples that are passed their best, discard the peel and core, then slice the apple (with a cheese slicer or vegetable peeler). Place the slices on baking parchment and dry in the oven on a low heat for a couple of hours until the apple slices have dried out. Take out the oven, leave for 5 minutes. The apples will be crisp. Store in a sealed container. Also works well with pears. I snack on these instead of crisps - yum!